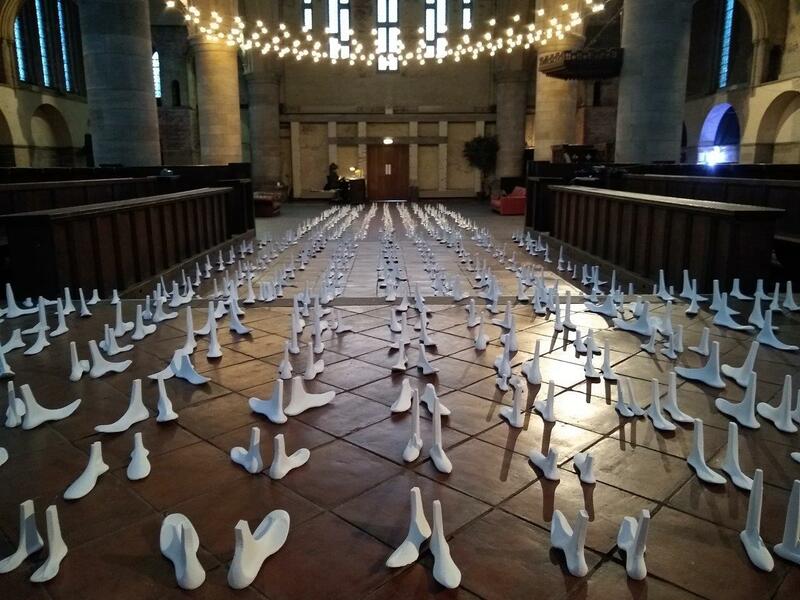 Stepping into the main space of Left Bank Leeds during Critical Mass we observe a caravan of disembodied plaster cast feet filing through the centre of this former church. Resembling cobblers’ lasts, mechanical foot-like forms used in shoe repair, over a thousand pairs of these plaster casts stand in rows under the vaulted ceiling, ascending and descending the three floor levels in a continuous snaking line. Although no taller than twelve inches above the floor, the casts anchor the viewers’ gaze to the ground in a space designed to invite eyes towards the heavens. Moving through the church causes motion sensitive electro-mechanical instruments to begin to play, triggering a soundscape of music box-like chimes via loops of perforated paper. The serene nature of these patterns adds to the contemplative feel of Critical Mass in this particular setting. This is an immersive large-scale installation by artists Eva Mileusnic and Bob Birch, produced in collaboration with the Refuge Council and Leeds City College. The piece was commissioned by the Donut Group, an informal network of arts venues in communities outside of the city centre, including Sunny Bank Mill, HEART – Headingley Enterprise and Arts Centre, Hyde Park Book Club, Slung Low, Chapel FM Arts Centre, Interplay Theatre, East Street Arts, Otley Courthouse and Union 105. Several of these venues hosted open workshops, allowing the public to participate in the casting process. Absence is keenly felt in this work, particularly the absence of the people whose journeys these feet make reference to. Although the figure is largely invisible within Critical Mass, the scale of this piece humanises the caravans of migrants we often seen on our television screens, demonised by the mainstream media, often presented to us in the form of incomprehensible figures and dehumanising data visualisations. Mileusnic’s work reminds us of the human tragedy behind migrant crises, whether caused by economic, political or religious unrest. Alongside or between the rows of larger feet, are smaller cast pairs. These are suggestive of the different generations affected by migration – enforced or otherwise. In this current climate, with the rise of nationalism and fear of an alien ‘other’, it is possible to visualise this piece as suggestive of a queue of bodies waiting at an unseen border checkpoint. Physical inertia unites the two elements, Mileusnic’s casts stand immobile in the space, awaiting processing at this imaginary border, while Birch’s music can progress nowhere and simply loops back on itself. The mechanical chimes are melancholic to begin with, but as more of the players start up, melancholy gives way to a feeling of disconcerting oppression. Several of these machines add layers of the same haunting tune while others add a discordant foil, as well as the eerie squeak and rustle of the mechanisms themselves, building the sound into an unnerving dreamscape. The choice to install the casts in tight rows with no space to walk between the rows of feet, prevents visitors from moving within the piece itself. For a visitor outside of the participatory workshops and outside of the physical boundary of the installation itself, a state of not knowing is established. Interpretation material is limited to an introductory flyer for the exhibition; it is therefore only possible to learn of the maps on the soles of the casts through an introductory conversation from the helpful and enthusiastic Left Bank staff on hand. The choice to make these maps an unseen element is a fitting metaphor, it is not possible to know a person’s journey simply by looking at them. This perhaps is representative of the experience of the migrant, being subject to the gaze of the native, and not being understood. Conversation therefore, becomes the tool which opens up both this installation and exchange between communities.